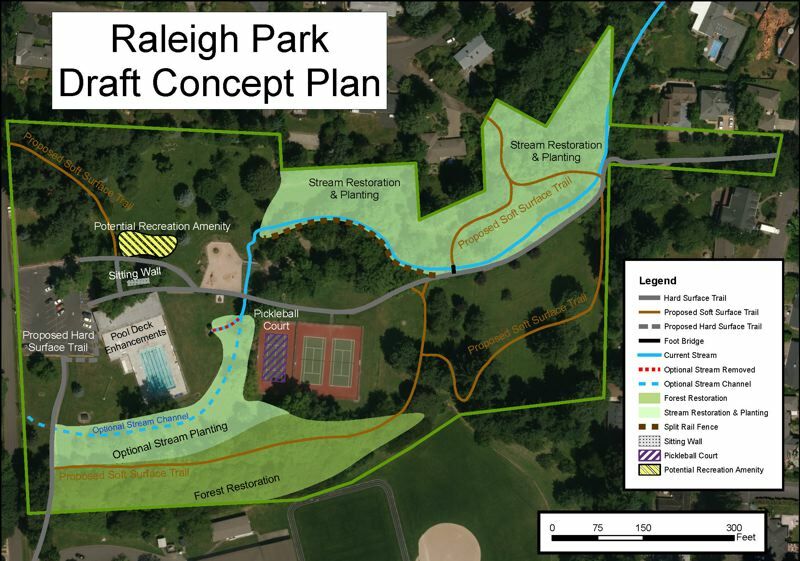 A concept plan for park improvements is being developed for Raleigh Park, located at 3500 S.W. 78th Ave. in Raleigh Hills, and the Tualatin Hills Park & Recreation District wants input from neighbors and park users before they put the plan to a vote next month. Before it was the beloved patchwork park that it is today, Raleigh Park was a golf course. With no "master plan" ever created, the community park is the result of gradual additions throughout the years. The latest version of the concept plan, created to address the desires of park users voiced at previous meeting, was presented at an open house on Wednesday, Sept. 27. THPRD will make further revisions to the plan based on input from that meeting and online during the public comment period which ends next Wednesday, Oct. 11. Improvements include replacement of the swimming pool deck and fence, and installation of a seat wall to improve drainage at the north side of the pool. Funds for these repairs are expected to be available during the 2018-19 fiscal year. The plan also aims to strengthen the ecological condition of the park's natural resources, with funds available through the park district's 2008 bond measure. If approved, the addition of native plants along the stream bank could prevent further erosion as soon as this winter. Other natural resource improvements include removal of the horseshoe pit in the Ash Grove area, removal of invasive species, such as English ivy, in wooded areas of the park and planting of native species. Extension of the trail system with "soft-surface" trails — likely packed gravel — that are pervious to water, and installation of park benches will allow for greater enjoyment of the park's natural areas. THPRD is considering daylighting the creek where it has been piped to flow under the pool, though this project would take at least several years to complete. Of the three tennis courts in the park, the westernmost court will either be fully transformed into a pickleball court or be made into a multi-purpose court with pickleball lines and portable netting to be stored on site. The concept plan sets aside a roughly 5,000-square-foot area in the northwest section of the park as a potential recreation area. If approved, further study of demographics and desires from the community will be needed to determine what amenity would best suit the area. Provided parks staff can integrate any further suggestions into the plan before the Nov. 14 board meeting, the final concept plan and updated map will be voted on then. The public is invited to attend and testify.